This skirt all started out with curtains I made for my bedroom. I doubt you’d be interested in plain, boring tab-top curtains, but the colour itself is to die for. All the time I went through the chore of making them, I was thinking – gosh, this fabric would have made such a pretty dress! Curtains had to be made, though, and rather sooner than later, as my appartment’s windows are not fitted with blinds or shutters. A few days later, however, I hung some Liberty fabric that I had just prewashed over my bedroom door, to dry (reduced space will make you pretty inventive); as I looked up, I realized the curtains next to it matched one of the spots in the design absolutely perfectly. I had just enough of my green taffeta left to accent a garment – as a belt, for instance… and thus the Spot On Skirt came to be. But, I don’t have that many skirts, and I have a few other dresses planned out anyway. I just figured a skirt would get more wear, and the reason why this Liberty had been sleeping in my stash for several years was that I wanted to make sure I’d make it into something I’d be wearing a lot. I therefore decided to simply use the skirt part from the dress pattern, and add my own belt and closure. I wanted something different from the regular dirndl, so I used the pleated version from the pattern (view B, the red one on the pattern cover). The skirt is really four rectangles of fabric sewn together, and pleated many, many times. Despite the previous post suggesting the opposite, I went pretty obsessive with cutting and sewing perfectly on grain, and matching the dots at the seams. 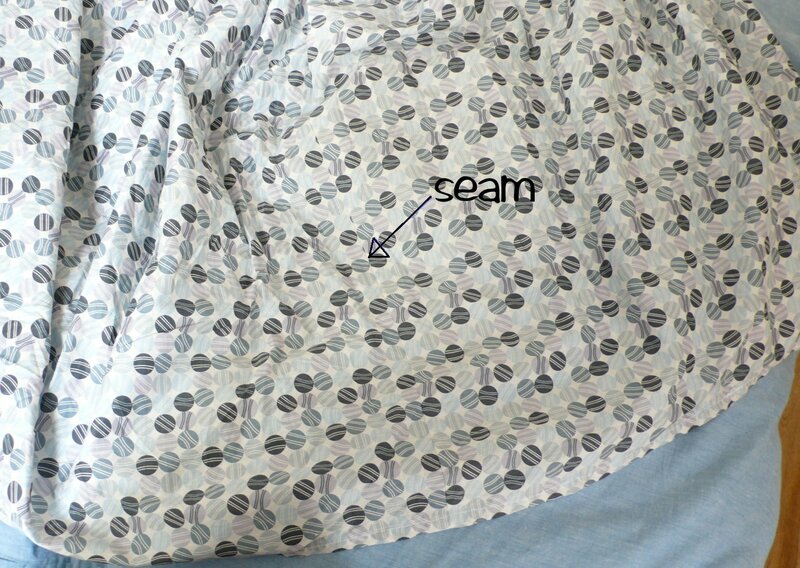 This was purely gratuitous, as all the tiny pleats make this kind of detail totally unspottable (ha!) when the skirt is worn. Still, I know my skirt is perfectly on grain, and therefore hangs as well as it can. I first wanted to add an invisible zipper as usual, but then realized buttons might be cute and more in keeping with the skirt’s era. I know zippers were already in use, but I also know my Grandma still used buttons way more readily than zippers at that time. I like how the white buttons on the green belt mirror the green spots on the white fabric. I am now working on Butterick 5209, which I just had to get and make after seeing Trena’s lovely version. Awww, that is one happy kitty- look at her smile! She did a wonderful job on the skirt. 😉 Would she like to come to the US to teach my dog to sew? He seems to think that his job goes no further than lolling around on the sofa supervising things. Love the skirt! Do you wear a crinoline slip underneath to make it “poofy” and stick out more? My mother had a crinoline slip from the 50’s and I loved to wear it as dress-up play as a child. 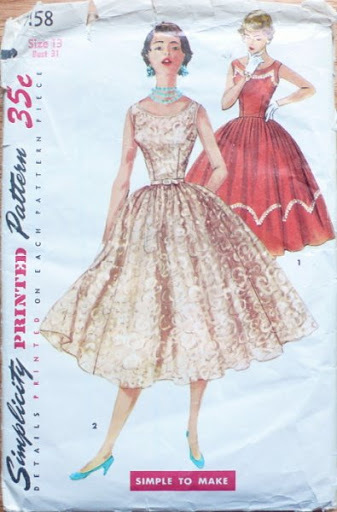 I have quite a few vintage patterns. I collect them, but have never sewn from them. You would be welcome to use them any time. The look on kitties face is priceless. So smug yet serene. Going to shop today to look for a pair of shoes like the pair you are wearing in the photos. Adorable looking skirt. It suits you well. 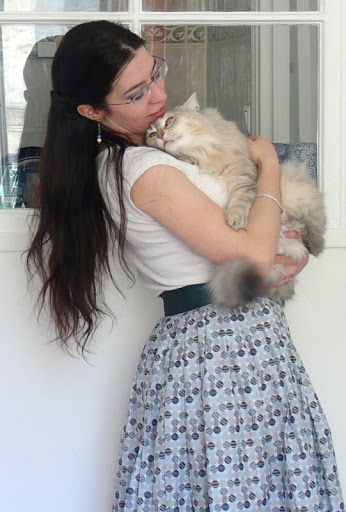 Beautiful skirt and always a pleasure to see a happy kitty! Beautiful skirt – can she teach my dogs to sew? They have no talents in the sewing line at ALL! Beautiful skirt. Looks like it was made for you! super cute! and it looks perfect on you! The skirt is lovely, a beautiful print and color. I love what you’ve done with this skirt. It’s got a real vintage, springy feel. Your furry supervisor has a look alikehere in California who assists me, too. Hello ma chère Isabelle ! J’aime beaucoup cette jupe, avec son ampleur rétro ! Est-ce que tu as fait une doublure façon jupon ? Enfin, quand je dis “tu”, je voulais dire, “est-ce que l’adorable minette t’as fait”, bien sûr ! I love the full skirt. My hips and waist don’t allow me to wear the style! I can only enjoy your pics! You and P’tite Mignonne did a great job on this skirt. It’ lovely! Beautiful! I love this kind of skirt…it´s vintage! bravo ! super jolis tes créations. j’aime beaucoup. hello… you may submit this blog to my webBlog Directory, keyworddir.info.. have a nice day! Wow this is lovely. The fabric is perfect for this style. Well I am not surprised. We know that P’tite Mignone has perfect taste. J’adore la jupe, Isabelle!!! Ce style te va comme un gant!!! Et quel tissu magnifique! Tu es bien chanceuse de pouvoir en trouver. Ici, au Québec, nous n’en trouvons presque plus depuis que les manufactures sont déménagées en Chine. Et ta P’tite Mignone est toujours aussi charmante!! So cute! I’m impressed with your patience in making such a full skirt with pleats instead of gathers. And your seam matching is insane! I love everything about it! I really should book a trip over there so you could teach me. Very cute skirt. Great job lining up the grain and the seam. Why is your cat so nice, while my cat is so terrible? It is an enduring mystery. Great skirt! Bravo Isabelle and beautiful kitty for the outstanding job! The skirt looks fantastic on you!